Properties in Tigliole average 4.7 out of 5 stars. Property 3: Boutique vacation hideaway for up to 4 adults. Unwind, relax, discover Piemonte. 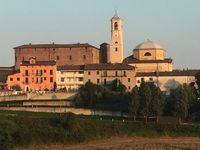 Welcome to the stunning landscape of Asti, in the heart of Piedmont. Property 12: Welcome to the stunning landscape of Asti, in the heart of Piedmont. Thank you so much to Paolo and his entire family for welcoming us into their beautiful apartment in Canale. Everything is exactly as pictured, with a well equipped kitchen, secured off street parking, and the fantastic spa facility. The apartment is comfortable and quiet, but within easy walking distance of the quaint downtown. What made our stay most special, however, was the incredible hospitality of Paolo. From the moment we arrived, we felt like we were being welcomed like old friends. He helped us organize two wine tastings (including helping us ship extra wine home), a truffle hunting experience we will never forget, and recommended many incredible restaurants. We leave Canale feeling like we have extended family in Italy, and hope our travels allow us to return someday soon.